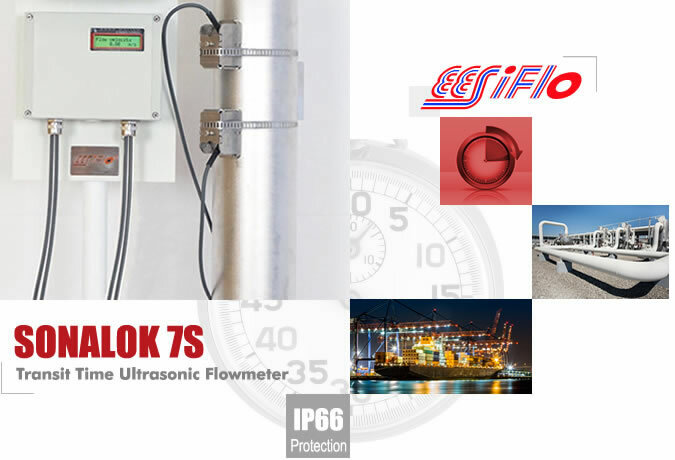 The EESIFLO Sonalok 7SZ range of non-invasive flowmeters utilises ultrasonic technology for the accurate flow measurement of liquids in full pipes. The field mounted flow transmitter can be configured via the keypad without any additional programming devices and is available as single channel unit. The measurement of flow is based on the principle that sound waves are influenced by a flowing medium. Measurements are made by penetrating the pipe with ultrasound and subsequently time differences, frequency variations and phase shifts of the ultrasonic signals are evaluated. This measuring technique has no effect on the flowing liquid. There is no pressure loss in the pipe and no wear on components of the measuring device. The ultrasonic sensors are clamped onto the outside of the pipe, thus eliminating the need to dismantle the pipework and interrupt the process. The EESIFLO Sonalok 7SZ can be applied to any type of standard pipe carrying clean or dirty liquids. Cost advantages when used with large diameter pipes, high pressure systems, etc.